A two-time Olympian. An NHL coach who helped create the National Team Development Program. A pair of highly respected Div. I college coaches. And a decorated Air Force officer with hockey experience at the highest levels. If Ken Martel has proven anything during his years as the recruiting coordinator for the National Team Development Program, it’s that he knows talent when he sees it. Martel, the technical director of the American Development Model, has put together a staff that will carry the word of USA Hockey’s revolutionary program designed to improve the quality and quantity of American players involved in the game from Mites to Midgets. To date, Martel has hired five of the six regional managers who will serve as mentors for associations around country. He is hoping to bring in the final member of his team in the coming weeks. Each member of the team not only brings an impressive resume to the position but also the passion to usher this groundbreaking program into the upcoming season and beyond. Roger Grillo, who spent the last 12 seasons as the head coach at Brown University, will serve as the ADM regional manager for New England and Massachusetts. Scott Paluch, who coached his alma mater at Bowling Green State University for the past seven seasons, will work the Mid-Am and Southeast Districts. Bob Mancini, who spent the past two seasons as a development coach for the Edmonton Oilers and has extensive coaching experience in the collegiate ranks and with USA Hockey, will oversee Michigan and parts of the Central and Mid-Am Districts. “I’m thrilled to be back,” Mancini said. “As much as I love the NHL and the Edmonton Oilers, this was too good an opportunity to be involved with. 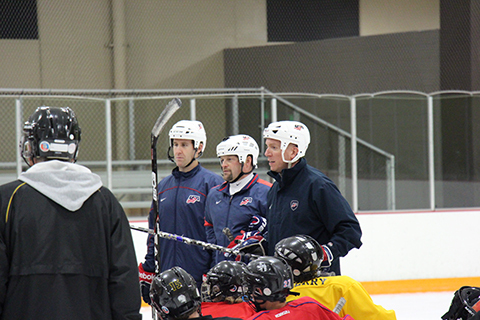 USA Hockey's ADM regional manager staff has since grown to 10 names, with Joe Bonnett, Rich Hansen, Dan Jablonic and Emily West rounding out the names listed in the article. 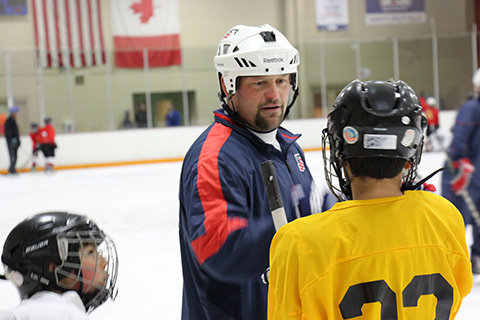 Guy Gosselin, a member of the 1988 and 1992 U.S. Olympic Teams, will lend his considerable expertise to coaches in Minnesota, the Dakotas and Wisconsin. He has extensive experience working at both the youth hockey and collegiate levels, and has worked in the rink industry in suburban Milwaukee. The final regional manager is slated to work with the New York and Atlantic Districts. While no timetable has been set, Martel is working hard to narrow down a list of candidates in hopes of filling the position as quickly as possible. The ADM is a nationwide initiative designed to provide local associations across the country with a blueprint for optimal athlete development that focuses on age-appropriate training utilizing long-term athlete development principles. In the early stages, the ADM will focus its attention at the youngest players, stressing more cross-ice hockey practices that will help develop their skills and make the game more fun, while cutting down on the competitive side of the sport that has made the sport more expensive and time consuming. “Developmentally, we found that what’s good for the pocketbook is also good for the players. It’s cross-ice hockey, which means more kids on the same sheet of ice and less travel,” Martel said. The regional managers will help deliver information to grass-roots programs in their area as well as provide assistance to coaches and administrators within local associations that will help them run practices and generally act as mentors for coaches in their area. “Our goal are to reach as many associations as quickly as possible and to spread the word of the ADM and get them to understand the merits of the ADM and implement it so kids can start benefitting from it,” Paluch added. With the start of a new season quickly approaching, the ADM team has a lot to do to win over the hearts and minds of skeptics, while providing support to those programs enthusiastically embracing what has been hailed as a revolutionary way of developing more skilled players at all age levels.